DWV Fittings | Instant Savings On All DWV Orders! 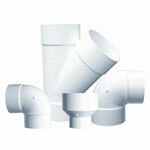 DWV Fittings are used for drain, waste and vent applications only. These fittings are not designed or tested to handle pressure. DWV fittings are used most commonly in plumbing applications where a continuous smooth media flow is very important. DWV fittings come as a glue or gasketed system. Fitting sizes range from 1 ½” up to 24”. DWV fittings are white in color and light in weight. DWV fitting are constructed with less sharp angles and have more longshaped bends for ease of movement inside the fitting.